candidates can apply online for this FCI Assistant Grade-3, AG-2 Jobs. 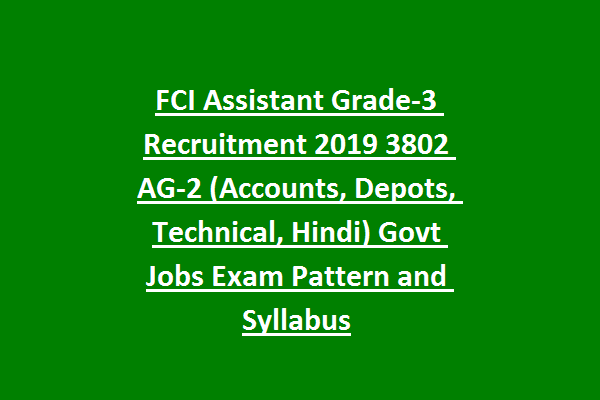 3802 Posts are in this FCI Assistant Govt Jobs Recruitment 2019. Last date to Assistant Grade-3 jobs online application form is 23-02-2019. Candidates selection for this FCI Assistant Grade 3 posts will be on basis of two stage written exam. Exam pattern and syllabus for this FCI Assistant Jobs is updated below along with Syllabus PDF. 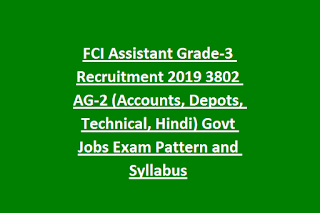 Complete Details of FCI Assistant Grade-3 Jobs Recruitment qualifications, Assistant Grade-3 selection Process, FCI Online Application, FCI Assistant Grade 3 Exam Pattern, AG -3 Exam Syllabus, Salary of Assistant Grade-3 and other details are given below. North East Zone: AG General-112 posts, AG Account-22 posts, AG Technical-3 posts, AG Depot-131 posts. Age limit 18y to 27y. For SC/ST candidates 5 years and for OC Candidates 3 years of age relaxation is applicable. Online Exam will be conducted in two stages for this FCI Assistant Jobs. For Phase 1 will be conducted. Those who qualified in Phase 1 they are only eligible for Phase 2 Exam. Phase 1 Online Exam will be conducted for 100 Marks. FCI AG Phase 1 Exam will consists of 3 sections. Each section time is 20 Minutes. Note 2: 15 times the number of vacancies only candidates merit list will be prepared for Phase 2 Exam. Note 3: 0.25 Negative Marking for each wrong answer. For AG III General, AG III Depots Posts Phase 2 online exam will be conducted for 120 Minutes and exam duration is 90 Minutes. For AG III Accounts, AG III Technical Posts: Phase 2 Exam consists of 2 Papers. Both the papers will be conducted in the same time only. 1. Basic Accounting concept including preparation of books of accounts. 2. Taxation including Income Tax and Goods and Services Tax. 3. Auditing: - (a) Auditing concepts and methods, (b) Internal & External audit of companies. aldehydes and acids, Inorganic Chemistry , Chemistry in daily life.